After a wet and windy Saturday, conditions will improve dramatically for Sunday. This past storm system left its mark on the area. Winds gusted between 50 and 60 mph causing thousands of power outages across New England. As of 5 p.m., there were 23,934 outages in Massachusetts; 20,502 outages in Maine; 10,536 outages in Maine; 6,967 outages in Vermont; 7,535 outages in Connecticut; 3,001 outages in Rhode Island. Rainfall amounts were generally between 1 and 2” with amounts over 3”. Perfect football/fall weather for Sunday. Expect sunshine, less wind and high temperatures to reach the mid 50s. 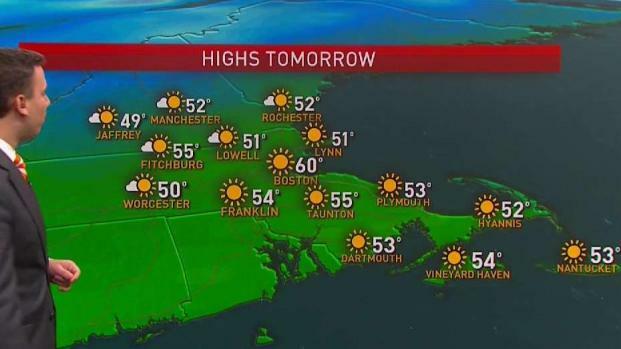 It will be chilly for the game at Gillette Stadium – dress for the 30s since the stadium is rural. Saturday Night: Clear. Less wind. Lows in the upper 30s. Sunday: Sunny. A perfect fall day. 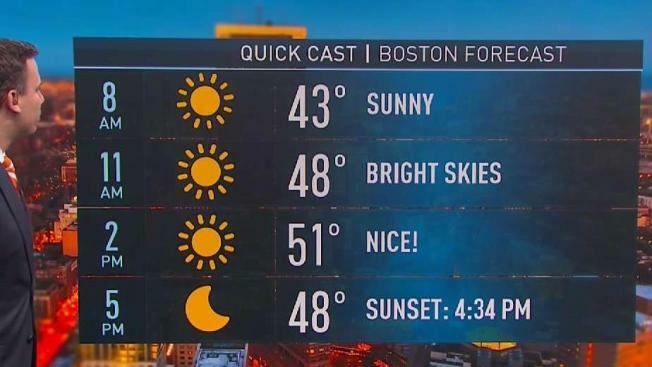 Highs in the mid 50s. Monday: Mainly cloudy. Periods of rain. Highs in the low 50s. Election Day will be unsettled. A similar storm to what we just saw this weekend will move through. Conditions will deteriorate through the day Tuesday. The worst of the weather will be Tuesday night into early Wednesday. Heavy rain and high winds are possible. Once the system moves out on Wednesday, temperatures will reach the mid 60s!